Do you know the kids song, Reach for the Stars? It goes something like this, "Bend and stretch, reach for the stars. Here comes Jupiter, next comes Mars." :) I don't remember the rest but you get the idea. That's what came to mind when I scrapped these pics of my first day of first grade. I'm guessing it was kind of a big deal, being the oldest of four girls to leave the nest and head off to school. My Mom always dressed us up and was always dressed to the nines herself. I can't imagine running after four girls all the time in such pretty outfits. I used to love going into her closet and trying on her "fancy" shoes. My favorite was a pair of white patent leather, high-heeled clogs. I thought those things were amazing. LOL! Yesterday was seven years since my Mom passed away. I thought it was fitting to scrap some pictures of her. I miss her as much today as I did on the day she died...As Alexa says, "there's a hole in my heart" and I am working as hard as I can to fill it with the memories I have. Sending lots of hugs, I can only imagine how hard it is for you around this anniversary. First of all, I WISH I had photos like this. Love the story of you going into your mom's closet. My girls do that at my MIL's. Hmmm...guess she has cooler clothes! haha Anyway, I LOVE your layout, great tribute to your mom. Hugs ad prayers to you. Love the page and the photo is priceless. and the Journaling. wow! What a lovely layout! It's so wonderful that you have the photos! This keeps her memory alive. Well done! Such a great layout!! Love the banners! 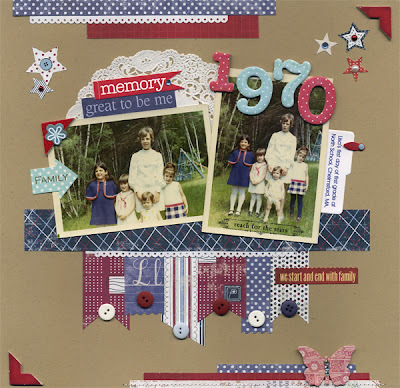 What a great layout, love the papers you used and those strips across the bottom. So beautiful, Lisa! Love your photos(!!!) and of course the beautiful banner garland :) Wonderful work! Love this one. You should have submitted it to a magazine for 4th of July page. It's a great layout.